An artist/filmmaker working for many years in installation, photography, video, film, performance, drawing and writing, Antin has an international reputation. She has had one woman exhibitions at the Museum of Modern Art, the Whitney Museum, the Wadsworth Atheneum, the La Jolla Museum (now the San Diego Museum of Contemporary Art), the Long Beach Museum, etc., as well as a major 30-year retrospective at the Los Angeles County Museum of Art, which traveled to several venues in the U.K. and included a book catalogue. She has created major installations at the Hirschhorn Museum, the Philadelphia Museum of Fine Arts, the Los Angeles Museum of Contemporary Art, the Jewish Museum in New York City, among others. She is represented in major collections including the Art Institute of Chicago, the Whitney Museum, the Museum of Modern Art, the Jewish Museum, the San Francisco Museum of Modern Art, etc. As a performance artist she has appeared in venues around the world including the Venice Biennale and the Ford Theatre in Washington, D.C.
Several of her mixed media, groundbreaking works such as 100 Boots, CARVING: A Traditional Sculpture, The Angel of Mercy, Recollections of my Life with Diaghilev, The King of Solana Beach, The Adventures of a Nurse, are frequently referred to as classics of feminist, postmodern art. As an artist she is represented by the Ronald Feldman Gallery in New York. She has written three books, Being Antinova (Astro Artz) and Eleanora Antinova Plays (Sun & Moon) and The Man Without A World; a film script (Green Integer) and a photo book 100 Boots (Running Press). She has made nine videotapes, among them Representational Painting, 1971, The Ballerina and the Bum, 1973, The Little Match Girl Ballet, 1975 and From the Archives of Modern Art, 1989, (all tapes distributed by Electronic Arts Intermix). She has written, directed and produced narrative films, among them the feature, The Man Without a World, 1991, (Berlin Film Festival, U.S.A. Film Fest., Ghent Film Fest., London Jewish, San Francisco Jewish, Women in Film, etc.) and The Last Night of Rasputin, 1989, (premiered with a live performance in a two-week run at the Whitney Museum), (all films distributed by Milestone Film & Video, N.Y.), and the video installations Loves of a Ballerina, 1986, Vilna Nights, 1993, and Minetta Lane, 1995. Her most recent awards include several AICA (International Association of Art Critics) awards including one in 2003 for best gallery show for “The Last Days of Pompeii”, a Guggenheim Fellowship in 1997 and the National Foundation for Jewish Culture Media Achievement Award in 1998. Antin has been a Professor of Visual Arts at the University of California at San Diego since 1975 where she was the recipient of the UCSD Chancellor's Associates Award for Excellence in Art in 1996. Antin's most recent work includes the Sydney Biennale with performances at the Sydney Opera House and the premier of a major new photographic work The Last Days of Pompeii at the Ronald Feldman Gallery in New York, the Kunsthalle in Vienna, the Craig Krull Gallery in Los Angeles and the Marella Arte Contemporanea Gallery in Milan, Italy. Her newest photographic piece “Roman Allegories” premiered in New York at the Ronald Feldman Gallery in Feb. 2005 and the Marella D’Arte Contemporary Gallery in Milan. Eleanor Antin's from Historical Takes. Eleanor Antin's "Constructing Helen," 2007. From the Classical Frieze Show at Galerie Erna Hecey in Brussels. 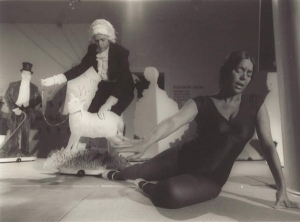 Eleanor Antin as Eleanora Antinova at the Santa Barbara Museum of Art, 1979.